Coeliac disease is an autoimmune disorder of the small intestine that occurs in genetically predisposed people of all ages from middle infancy onward. 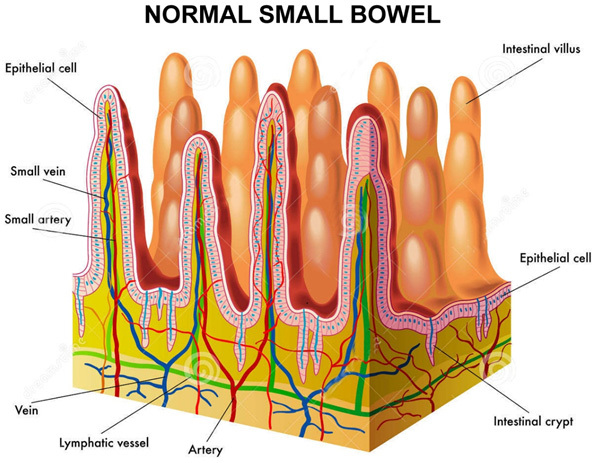 It is a condition in which the lining of the small intestine becomes damaged when it is exposed to even small amounts of gluten, which is a protein found in wheat, barley, rye and possibly oats. As a result, affected patients absorb food and nutrients poorly. Upon exposure to gliadin, the gut enzyme found in the small intestine called “Tissue Transglutaminase” modifies the protein, but this enzyme by accident cross-reacts with the normal small-bowel tissue, causing an inflammatory reaction. That leads to a truncating of the villi (finger like projections from the wall which normally play a vital role in absorption of nutrients) – this is called villous atrophy. Increasingly, diagnoses are being made in persons without symptoms as a result of increased screening and the community is much more aware of the condition. According to latest estimates, more than 300,000 Australians have the disease but are not aware they have it. It can develop at any age, and although it used to be associated with young children, Coeliac Disease is now more commonly diagnosed in adults. Coeliac Disease can often run in families, so if you have a close family member such as parent, brother or sister, then you have a 1 in 10 chance of developing Coeliac Disease. Symptoms of Coeliac Disease can be non-specific, and ranging from many to none at all. Many Australians have the disease and yet they don’t know they have got it. Diarrhoea, loss of weight, nausea, flatulence and abdominal discomfort are common complaints. Tiredness and weakness are also common, usually because of a degree of iron and/or folic acid deficiency, sometimes resulting in anaemia. 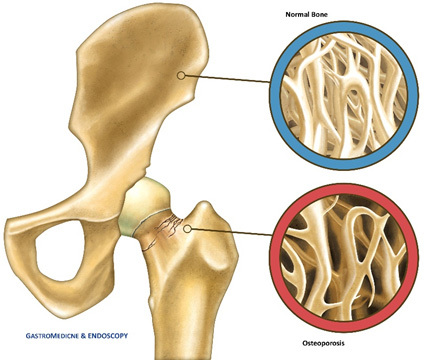 Some patients may also be diagnosed following investigation for osteoporosis. Less commonly, mouth ulceration recurring miscarriages or infertility can be the presenting feature in adults. In children, Coeliac Disease often causes poor weight gain, delayed growth and development, irritability and a poor appetite, in addition to bowel problems and anaemia. It should be kept in mind that many of the above mentioned complaints are very common in the community and are usually not due to Coeliac Disease. Nonetheless, it is widely accepted now that this condition is under-diagnosed and should be considered in a broader range of patients than has been the practice in the past. Symptoms are due to inflammation in the lining of the small intestine, which prevents food and nutrients from being properly absorbed. Symptoms first develop soon after weaning when the baby starts eating solid foods containing gluten. The baby may fail to grow or to gain weight. As food is not being absorbed properly, the faeces (stools) may be pale and bulky. Smelly diarrhoea may occur. The abdomen (tummy) may become swollen. The baby may have repeated vomiting. Poor absorption of food may cause deficiencies of vitamins, iron, and other nutrients. Anaemia due to poor absorption of iron is common. Other common symptoms include: abdominal pains which tend to come and go, excess wind, bloating, diarrhoea, and tiredness or weakness. Mouth ulcers may also occur. You may lose weight due to poor absorption of food. However, most adults with Coeliac Disease do not lose weight and are not underweight. Occasionally, an itchy skin condition called dermatitis herpetiformis can occur in some people with Coeliac Disease. The rash is itchy and characterised by blisters that burst when scratched. The rash usually appears on your elbows, knees and buttocks, although it can appear anywhere on your body. It is estimated around one in five people with Coeliac Disease also develop dermatitis herpetiformis. The exact cause of dermatitis herpetiformis is not known, but as with Coeliac Disease, the condition is associated with gluten. Like Coeliac Disease, it should clear up after switching to a gluten-free diet. If the common symptoms described above develop, the diagnosis may be made quickly. However, common or typical symptoms do not always develop. Particularly in adults, the areas affected in the gut may be patchy. Symptoms may then be mild, or not typical, and it may be a while before the diagnosis is made. If Coeliac Disease is untreated, being unable to digest food in the normal way could cause you to become malnourished, making you feel tired and lacking in energy. Malnutrition in children can lead to failure to grow at the expected rate, both in terms of weight and height, as well as delayed puberty in older children. You should first approach your general practitioner. A medical history and an examination will be performed and, if thought necessary, further blood tests will be undertaken to help diagnose the condition. Your doctor may choose to refer you to see a Gastrotenterologist. If Coeliac Disease is suspected, a gluten-free diet should never be started until the condition has been properly diagnosed, as avoidance will interfere with establishing the correct diagnosis. The gluten-free diet should always be undertaken with medical supervision. Your Gastroenterologist may advise you have further blood tests and/or undergo a gastroscopy to confirm the diagnosis. Coeliac Disease should always be made by histology, and it is important to note that multiple biopsies from the small bowel are required, hence it is recommended that your procedure is performed at reputable centres. Again, your local doctor should be your first contact. There are blood tests available that are useful to screen for Coeliac Disease. You may like to print this leaflet and take it with you when you see your doctor, indicating where you have read about the condition. Your family doctor may choose to refer you to see one of our Gastroenterologists (download referral form). You can make an appointment	on line for your convenience. Type 1 diabetes. Children and teenagers under 16 should be tested for the most common gene types that are associated with Coeliac Disease. These are HLA-DQ2 or HLA-DQ8. If they do not have these types, they are extremely unlikely to develop Coeliac Disease. If this test is not available they should have the blood test for the specific antibody, every three years. Close relatives (parent of, child of, brother/sister of) of a patient with Coeliac Disease. Auto-immune conditions such as thyroiditis, Sjögren’s syndrome or arthritis. Although there is no once and for all cure for Coeliac Disease, the symptoms can be kept away by having a diet free from gluten. Also, having a gluten-free diet reduces the risk of developing complications in the future. Developing osteoporosis (thinning of the bones) due to the nutritional deficiencies which occur with Coeliac Disease. Some doctors would recommend a bone strength scan every 2 years (DEXA scan). Developing lymphoma (a type of cancer) of the gut in later life. This is rare, but is one of the main reasons why you must be very strict with a gluten-free diet, even if you have no symptoms. Developing other immune-related diseases (auto-immune diseases) such as type 1 diabetes, an underactive thyroid, Sjögren’s syndrome and primary biliary cirrhosis (a rare liver condition). Having a baby that has a low birth weight or is born prematurely if you become pregnant. A common mistake is to eat small amounts of food which contain gluten. This may be unintentional. However, some people wrongly think that a small amount won’t matter. It does. A well-known example is thinking that the small amount of bread in a communion wafer will not matter. Even this small amount of gluten is sufficient to cause symptoms, and to maintain the increased risks associated with Coeliac Disease detailed above. Some people with Coeliac Disease may not realise they are taking small amounts of gluten. They may feel well, or ignore mild symptoms such as bloating or mild diarrhoea. Again, the increased risks (osteoporosis, etc) still remain if any gluten is eaten. If you do not eat any gluten, you can expect to be free of symptoms and to have a normal healthy lifespan. The increased risk of developing other autoimmune disorders reduces. Eating a gluten-free diet also reduces the risk of developing lymphoma. If Coeliac Disease is suspected, a blood test to detect a certain antibody that occurs in Coeliac Disease may be advised by your doctor. It is important that you are eating a diet containing gluten for at least six weeks before the blood test is performed.If the blood test is positive or your doctor strongly suspect Coeliac Disease, then you may be referred to a Gastroenterologist (see Our Specialist Staff) who may arrange for a gastroscopy	so that biopsies of the small bowel lining can be taken. Biopsies are small samples of tissue which are then sent to a histopathologist who will examine the samples using a microscope to see if the typical changes of Coeliac Disease are present. The biopsy is usually taken by a thin flexible tube (endoscope) which is passed down the gullet (oesophagus), through the stomach and into the small intestine. Important note: if you suspect that you may have Coeliac Disease, you should see your doctor but do not treat yourself by going on a gluten-free diet (described below) without a confirmed diagnosis. If you do go on a gluten-free diet before the diagnosis is confirmed, then any tests done at a later time may not be conclusive and may even give negative results, and you may have to undergo repeat testing. Here at GastroMedicine & Endoscopy, we offer Endoscopy as this is what our doctors specialise in. The doctors will take biopsies of the duodenum during the procedure and send them away to the lab for testing. There is no cure for Coeliac Disease, but switching to a gluten-free diet should help control symptoms and prevent the long-term consequences of the disease. Even if symptoms are mild or non-existent, it is still recommended to change your diet, as continuing to eat gluten can lead to serious complications. It is important to make sure your gluten-free diet is healthy and balanced. An increase in the range of available gluten-free foods in recent years has made it possible to eat both a healthy and varied gluten-free diet. As a protein, gluten is not essential to your diet and can be replaced by other foods. It is important to always check the labels of the foods you buy. Many foods – particularly those that are processed – contain gluten in additives, such as malt flavouring and modified food starch. 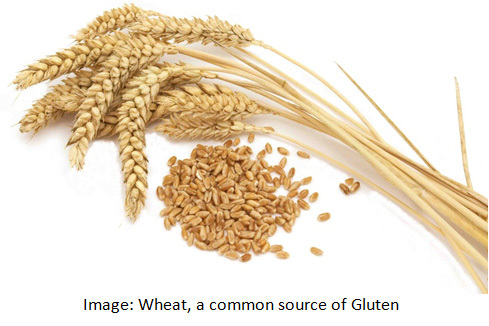 Gluten may also be found in some non-food products, including lipstick, postage stamps and some types of medication. Cross-contamination can occur if gluten-free foods and foods that contain gluten are prepared together or served with the same utensils. Most dairy products, such as cheese, butter and milk (beware of Lactose mal-absorption, which is common in patients with Coeliac Disease. See Fructose/Lactose breath testing). By law in Australia, food labelled as gluten-free can contain no more than 20 parts per million (ppm) of gluten. For most people, these trace amounts of gluten will not cause any problem. However, there are a minority of people with Coeliac Disease who are unable to tolerate even trace amounts of gluten and require a diet completely free from cereals. Oats do not contain gluten, but many people with Coeliac Disease avoid eating them because they can become contaminated with other cereals that do contain gluten. It is recommended you should avoid eating oats until your gluten-free diet has taken full effect and your symptoms have been resolved. Once you are symptom free, gradually reintroduce oats into your diet. If you develop symptoms again, stop eating oats. Do not introduce gluten into your baby’s diet before they are six months old. Breast milk is naturally gluten free and all infant milk formulas are, too. You can buy special gluten-free flour, pasta, bread and other foods. You can visit our dedicated Gluten Free Shop (LivWell), to check out the range of products available. You may surprised that pricing may be cheaper than supermakets. Avoiding gluten is for life. If you eat gluten again, symptoms will return. Even small amounts of gluten can sensitise the gut again. To avoid symptoms and complications, you must be strict about avoiding all foods that contain gluten. In addition to avoiding gluten, you may be advised to take some vitamin, calcium and iron supplements, at least for the first six months following diagnosis. This is to replace any deficiencies and also to make sure you get enough of these whilst the gut lining is returning to normal. The Haemophilus Influenza vaccine- which protects against pneumonia, and rare cases of meningitis. The pneumococcal vaccine- which protects against infections caused by the bacterium Streptococcus pneumoniae. As well as cutting gluten out of your diet, your Gastroenterologist, GP or dietitian may also recommend you take vitamin and mineral supplements, at least for the first six months after your diagnosis. This will ensure you get all the nutrients you need while your digestive system repairs itself. Taking supplements can also help correct any deficiencies, such as anaemia (a lack of iron in the blood). If you have dermatitis herpetiformis (an itchy rash that can be caused by gluten intolerance), cutting gluten out of your diet should clear it up. However, sometimes it can take longer for a gluten-free diet to clear the rash than it does to control your other symptoms, such as diarrhoea and stomach pain. If this is the case, you may be prescribed medication to speed up the healing time of the rash. You may need to take medication for up to two years to control your dermatitis herpetiformis. After this time, you should have been following a gluten-free diet long enough for the rash to be controlled without the need for medication.